We all know that sugary, junk food isn’t going to do us any favors for our waistlines, but eating lots of sugar will also rot your teeth and lead to tooth decay. At Thunderbird Dental Centre in Langley, we will ensure your teeth feel healthy and can give you strategies to prevent tooth decay. So what can you do to prevent tooth decay and lead a healthy lifestyle? Staying away from fast food and foods high in sugar is the obvious answer, but there’s other things you can do as well. Check with a dentist at Thunderbird Dental about using supplemental fluoride, a product which can make your teeth stronger. 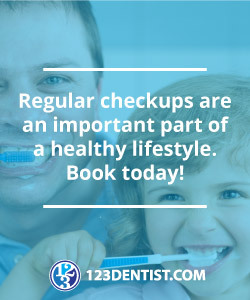 Be sure to book an appointment with an oral health expert at Thunderbird Dental in Langley for your regular dental check-up.